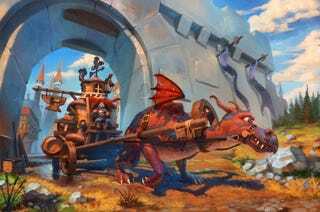 This week's writing prompt finds us traveling by an odd conveyence: a dragon-drawn cart. What sort of fellow gets around thanks to a tatter-winged wyrm? The illustration above is "Journey" by Ivan Smirnov. As always, we invite you to come up with your own short story inspired by this image and post it in the comments.